When we become adults, and then older adults, we drop certain things. Part of that is just deciding who we are. We try things; some work out and some don't. Some things fit with our adult identity and some don't. That's natural. But a second group of things in our life just fade away for no good reason. They could fit with our grown-up selves, but they get lost in the rush. Then one day when we're, say, fifty-four (just to pick a number out of the air of no particular significance) we wake up and think, "gee, I sure miss doing that." I used to draw a lot. I was never more than a doodler, but I enjoyed it. It was more than a youthful enthusiasm; I kept drawing till I was over forty. But for some reason it faded away after that. I miss it. Today is my birthday and it seem like a good time to start drawing again. 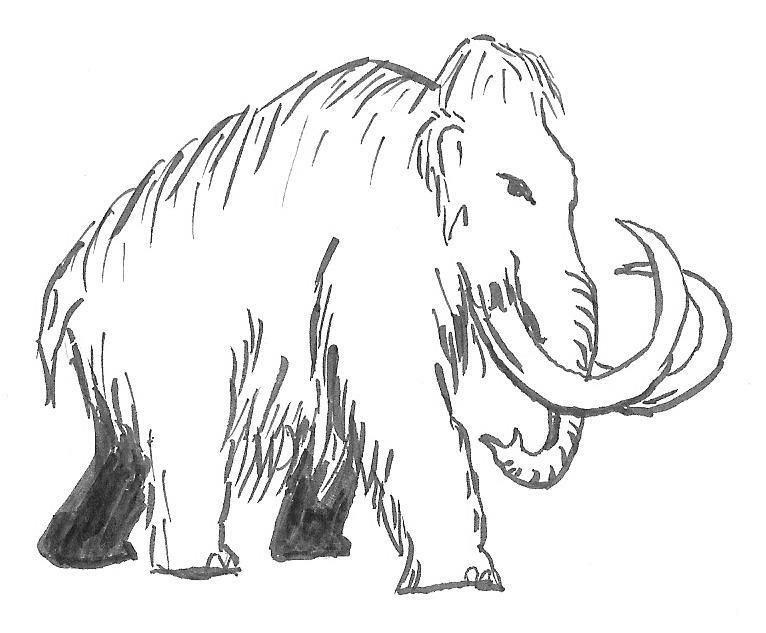 This is a mammoth I drew. When i drew, I always worked in pen, steel dip pens when I was younger and rapidograph when I was older. I never tried drawing with a brush. This is my first.